The knives were out in the SAD for Finance Minister Manpreet Singh Badal last night itself. The senior leadership, which was in a mood to remove the “irritant” once and for all took the cue from party chief and Deputy Chief Minister Sukhbir Singh Badal, who cancelled his visit to Central Asian countries to personally monitor the crisis precipitated by Manpreet’s utterances against him. All is seemingly not well politically in the late Punjab Chief Minister Beant Singh’s family. There are indications that Beant Singh’s grandson, Ravneet Bittu, reportedly a blue-eyed boy of Congress General Secretary Rahul Gandhi, is supporting his aunt Gurkanwal Kaur’s political rival, Congress leader Shiv Kanwar Singh Sandhu. Noted environmentalist and Punjab Pollution Control Board (PPCB) member Sant Balbir Singh Seechewal said that a whopping 4,000 persons become victims of cancer in Punjab every year. The main reason: contaminated water, he said. Tension started brewing at the Mansa Civil Hospital this morning, where the body of BKU (Ekta-Dakonda) leader Pirthi Pal Singh (35) had been kept, when farmers and farm workers started assembling there. Sensing the gravity of the situation, the district administration deployed police force at the hospital and at all entry points to the town. Leader of the Opposition in the Punjab Assembly Rajinder Kaur Bhattal today demanded that the Governor of Punjab should seek a trust vote from the ruling SAD-BJP ruling combine in Punjab. After a gap of 12 years, the University Grants Commission will open a centre for UGC-NET at Punjabi University here in December. State Health Minister Laxmi Kanta Chawla has directed the Senior Medical Officers to abide by the rules prescribed by the Punjab Pollution Control Board (PPCB) regarding Civil Hospitals violating the Biomedical Waste (Management and Handling) Rules. Policemen allegedly dragged and pulled the protesting unemployed ETT (Elementary Teachers Training) teachers today, during the visit of Education Minister Upinderjit Kaur, while the teachers were protesting before the minister. He walked 13,105 km backwards across 164 districts in 21 states and also cycled 10,000 km in around 200 districts. And it is all for protecting the environment amid rising apprehensions of global warming. 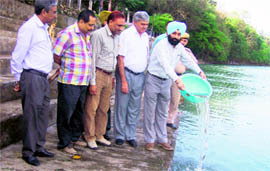 National Fertilizers Limited (NFL) released seeds of catla fish into the Sutlej yesterday to compensate for losses caused to the flora and fauna with it released industrial effluents into it recently. Police Suvidha Centres will be opened in all the subdivisions of the state within two months. 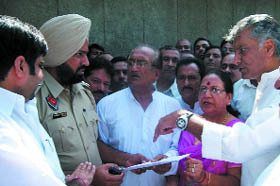 Making an announcement in this regard after reviewing the functioning of the Civil Lines police station, which has achieved the distinction of being the first police station in state to be granted ISO 9001:2008 certification by Moody International Certification Limited, Punjab, DGP PS Gill said in the next two years, all police stations of the state would have an ISO certification. Leaders cutting across party lines today came together and took out a protest march here and met the SHO of the city police station demanding that gangsters, who have been operating in the town without any fear of men in uniform, must be taken to task. Muslim girls would soon be able to take benefits of the Shagun scheme of the Punjab Government. Giving this information, chairman of Minority Commission, Punjab, Munawar Masih said on the recommendations of the Commission, the Punjab government would extend the scheme to include Muslim girls as well. Heena has been able to trudge that extra mile that her father always yearned to walk. It was a proud moment for Rajbir Singh Sidhu when his daughter, Patiala shooter Heena Sidhu, bagged a gold medal today in women pairs’ 10m air pistol event at the Karni Singh shooting range at the Commonwealth Games in New Delhi. Terming Sikh leader Jagdish Singh Jhinda’s claim regarding people’s demand for a separate Shiromani Gurdwara Parbandhak Committee (SGPC) for Haryana as baseless, SGPC president Avtar Singh Makkar has said this didn’t have any ground. According to sources, there were two views on how the situation would be dealt with from the very beginning. There was a feeling among senior leaders not to strike out against Manpreet keeping in view the fact that the matter should be best resolved by the Badal familiy. However, Sukhbir’s decision to forgo his Central Asia trip as head of a delegation of progressive farmers was a clear indication that the time had come to deal with Manpreet before it was too late. Disciplinary committee member and former minister Tota Singh, while putting the issue in perspective during a conversation with TNS, said senior leaders were “most unhappy” with Manpreet’s attitude. Tota Singh said Manpreet seemed to have forgotten that Chief Minister Parkash Singh Badal had fielded him and not Sukhbir as the party candidate in the Gidderbaha bypoll in 1995. “I and other senior leaders campaigned in villages to convince people to vote for him,” he said, adding, “Now he is questioning us and our seniority”. Other senior leaders, while speaking to TNS, claimed that the issue was no longer one of debt waiver as being claimed by Manpreet. “He has gone to the extent of deriding the party chief and Deputy Chief Minister by insinuating that he went to better schools and colleges than the latter and that Sukhbir’s functioning was corporate in style while his was socialist.” One of the leaders said this was a deliberate attempt to pull down a leader by muddying his reputation, adding Manpreet was free to talk about anything to Sukhbir as a brother but must give him due respect as party President. Meanwhile, Manpreet was not reachable but he succeeded in meeting Union Finance Minister Pranab Mukherjee, who, he claims, has constituted a subcommittee to decide on a loan waiver for Punjab. However, BJP sources said Manpreet did not visit party President Nitin Gadkari or senior leader Arun Jaitley. The Finance Minister had reached out to the BJP here yesterday but had been rebuffed by its legislature party leader Manoranjan Kalia who advised him to explain his position to his party. The late Beant Singh’s daughter and a former Punjab minister, Gurkanwal Kaur has been contesting from this seat since 2002 and she again wants to contest from this seat in the forthcoming poll, scheduled to be held in 2012. The Jalandhar cantonment seat is considered as a Congress citadel as the party won all except the last Assembly elections from here. Bittu’s uncle, Tej Prakash Singh, the late Beant Singh’s son, could not remain a minister during the previous Congress government. The rule said only 15 per cent of the Assembly members may become ministers and it was decided to make only one minister from the late Beant Singh’s family. The ministry went to Gurkanwal Kaur. Political experts say now the late Swaranjeet Singh’s son, Bittu, may be making pre-emptive efforts to avoid repetition of the same episode. Feeling uneasy after this development, Gurkanwal called up her nephew, Bittu, to talk to him on the issue. Confirming this, Gurkanwal told The Tribune that Bittu said that he shared dais with Sandhu unintentionally as the latter had been called to the Press Club by the local Congress councillor, Dinesh Dhal Kali. She admitted that Bittu should have denied Sandhu’s statement of supporting him in getting the ticket there itself. She said it had been decided in their family that her brother, former minister Tej Prakash Singh, would not contest but his son, Gurkirat, would try his luck in the forthcoming Assembly elections. Saying that she will also talk to Tej Prakash on the matter, Gurkanwal further stated that Sandhu was not even a primary member of the Congress. On the contrary, Sandhu said he had started his political career as block Congress president in 1975 under the leadership of the late Sanjay Gandhi. He was not only a primary member of the party but also active in Jalandhar cantonment for the past over three years, he added. Speaking to mediapersons here, he said the water in Ludhiana’s Buddha Nullah and Kala Sangha drain near Jalandhar had become so poisonous that presently there were no animals in these water bodies. “If animals can’t survive in these water bodies, one can easily imagine that the situation is very serious,” he asserted, while adding that the quality of water in the state had deteriorated a lot. He expressed concern that there had been cases wherein people lost their lives because of consuming unfit drinking water. “We have been to Bikaner Cancer Hospital. It was shocking to know that of the over 6,000 cancer patients being admitted to this hospital annually, nearly 4,000 are from Punjab alone,” he said. Seechewal, however, lauded the steps being taken by Punjab Chief Minister Parkash Singh Badal to ensure that rivers in Punjab were cleaned at the earliest. “The announcement of a project of Rs 2,300 crore for cleaning the rivers of the state is a commendable work,” he added. He also said Punjab had immense water but there was need for concerted effort to ensure people get pure drinking water. “Also, if the government establishes proper plants for treatment of water in order to make it fit for irrigation, it will immensely help the agriculture sector as well,” he opined. Despite this, farmer union activists headed by their state leaders, including Joginder Singh Ugrahan of the BKU (Ekta-Ugrahan), state president of the BKU (Ekta-Dakonda) Buta Singh Burjgill and Ruldu Singh Mansa of the Punjab Kisan Union, held a protest rally at the hospital. Pirthi Pal was allegedly shot dead yesterday when arhtiyas and their goons allegedly opened fire at activists of the BKU (Ekta-Dakonda) for opposing the auction of land of Bhola Singh of Veero Ke Khurd village, who owed debt to a commission agent, Ram Krishan of Budhladha. Two BKU activists, Tarsem Singh and Lachhman Singh, had sustained bullet injuries. Terming Pirthi Pal a “Shaheed”, they accused the arhtiya, his goons and the Naib Tehsildar of Budhladha of opening fire at BKU activists for objecting to take possession of 10 kanals of land of Bhola Singh for auction. The agitators relented only when Mansa SSP Mansa HS Mann assured them to nab the accused. However, before leaving the hospital, the agitators announced that they would wait till October 14 and if the accused were not nabbed, they could take any extreme step. Later, they put the body of Pirthi Pal in a four-wheeler and the motorcade moved towards his native village Chak Ali Sher. Before reaching the village, the procession crossed through Veero Ke Khurd village, where the incident had taken place, and people raised slogans to pay respect to the departed soul. He was cremated in Chak Ali Sher amid heavy deployment of police force. Hundreds of activists belonging to various farmer and farm worker unions attended the last rites. Meanwhile, sources said the police had arrested some of the accused. However, the Mansa SSP did not confirm the report. He confirmed that the Naib Tehsildar of Budhalada, Subhash Mittal, who was accused of accompanying the assailants, had also been booked along with five persons against whom a case of murder was registered. Bhattal, who was here in the national Capital to meet senior leaders of the Congress, said the difference of opinion among the Akalis especially between the son and nephew of Chief Minister Parkash Singh Badal had led to confusion in the state and was causing harm to Punjab. Sukhbir Badal, the President of the SAD, and Manpreet Badal, the state Finance Minister, had openly aired their differences over the Centre’s proposed Rs 35,000-crore loan waiver to Punjab, subject to some riders on improving the functioning of the state and reducing subsidy. While welcoming the UGC move, Vice-Chancellor of the University Dr Jaspal Singh said a pending demand of thousands of students of Malwa region has been fulfilled, who earlier had to travel long distances in order to appear in the test. He added that the test would be held on December 26 in 77 subjects and all necessary arrangements would be made for its smooth conduct. He told that director, planning and monitoring of the university, Prof Devinder Singh had been appointed the coordinator for this test. Sources informed that the university was the regular centre for UGC-NET examination till 1998, but then there was a complaint against the university that they helped few students in the examination. As a result, the UGC had ordered an enquiry against the university and then closed the centre. Chawla was here to attend a national campaign at PAU on “Yoga and Naturopathy for Holistic Health” organised by the Central Council for Research in Yoga and Naturopathy, New Delhi, and the Department of AYUSH, Ministry of Health and Family Welfare. “The system to follow the Biomedical Waste (Management And Handling) Rules with precision is being formulated but its implementation at the level of a hospital will take some time,” Chawla said. She was on a visit to Jandwala Bhimeshah village of this subdivision to inaugurate the building of Government Middle School. According to an eyewitness account, as the minister started addressing a public meeting in the school, a group of unemployed ETT teachers, who had intruded into the audience, started raising slogans against her and the Punjab government in support of their demands. The police initiated action and allegedly pulled and manhandled the agitating teachers and dragged them out. It is learnt that some agitating unemployed ETT teachers were reportedly removed by force and five of them were taken into custody. Those rounded up include Unemployed ETT Teachers Union Malwa Zone president Baljit Singh Kandukhera, Daljit Singh Cheema, Suresh Kumar, Gurpreet Singh and Ashish Kumar. The SHO of Arniwala police station (Fazilka subdivision), Tirlok Singh, confirmed that the unemployed ETT teachers, who were raising slogans outside the programme venue of the Education Minister, were rounded up and kept in the Arniwals Sheikh Subhan village police station. He said a case had been registered against the teachers. The Fazilka DSP expressed ignorance about the rounding up of the agitating teachers. 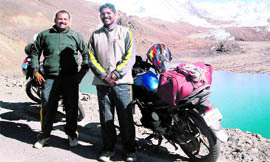 Tamil environmentalist D. Muniappan, alias Raju, was in Amritsar today while on his way back on motorbike after touching the Khardung La as part of his speed bike rally to spread the word for environment conservation across the country. Raju not only sensitises people to the environment but also plants saplings all through his route. “A group of 12 bikers, including me, started the rally from Panjim in Goa on September 22 and after passing through Maharashtra, Daman, Dadra Nagar Haveli, Gujarat, Rajasthan, Haryana, Chandigarh, Punjab, Himachal and Jammu & Kashmir, we reached Leh and finally to Khardung La. We were carrying 10 to 12 plants in each of our bikes and en route we were planting them wherever we thought they could be taken care of in a proper way,” said Raju. Raju and his team also extended a helping hand to the flash flood victims in Leh. “We were not in a position to help them monetarily. So we decided to help them re-build their houses. We worked with them for three days before continuing with our rally,” he said. What makes his effort all the more applauding is the fact that he hasn’t received a single penny from anyone to take out the rally. “I have ended up spending all my savings that I had accumulated over the past few years. The only help came from Suzuki which gave me a bike for the rally,” he added. Raju, who hails from Salem district in Tamil Nadu and is working as a health consultant in Anand district in Gujarat, hasn’t tied the knot till now. On the prevailing state of environment, he said the situation was alarming and it would need thousands of Rajus to save the environment from the further degradation. He intends to plant a sapling at the Wagah before resuming his rally tomorrow. 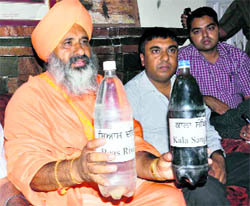 SDM Lakhmir Singh and NFL senior officials released the first batch of 35,000 catla fish seeds. In total, 5 lakh fish seeds are to be released in river, including 1 lakh catla, 2 lakh rohu and 2 lakh mirgal (all indigenous carps) fish seed. The fish seeds were released after being weighed in the net it was brought in. Trucks loaded with fish seeds have reached Nangal and will be gradually emptied off in the Sutlej. Seeds of 3 to 4-inch length (at the cost of Rs 1 per piece) were added to the Sutlej. At the end of the completion of task, it would cover water spread in almost 360 hectares of area. Assessment has been done on the basis of norms provided by the National Fishery Development Board, the Government of India. The NFL will be adding seeds worth Rs 7.20 lakh for the rejuvenation of the water body. A committee comprising of chairman SDM Lakhmir Singh, member Secretary Assistant Director, Fisheries, Sukhwinder Singh; member from the NFL and member Executive Engineer Headwater Works, Ropar, was formed for implementing the project. On May 9, fishes were found lying dead from Bela village Dhiani to Darauli area over a stretch of around 9km downstream the effluent discharge area of the NFL. “The officer/employee can also send complaint through fax at 0175-2305056 or can make a call at 0175-2214229 on any working day from 10 am to 4 pm. The special cell created to resolve such problems will send the complaints to the section concerned on e-mail and the section head will be asked to provide immediate clarification on the matter,” Seth said. 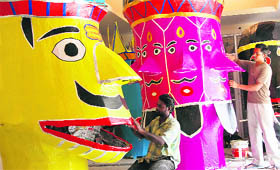 Gill further said that for setting up Suvidha Centres, funds to the tune of Rs 15 crore had already been released. “Suvidha centres would offer various kinds of facilities to the commoners regarding matters pertaining to the police administration and by setting up such centres at the subdivision level, the Punjab police would take a lead in providing good services to the general masses,” he asserted. The DGP also said that in order to modernise the Punjab police, police stations of the state would be equipped with state-of-the-art communication facilities. He further said that the in charge of the police station would be provided with highly advanced mobile phone sets, having GPS facility. “Also, in order to speed up the process of investigation of cases in the coming days, we plan to provide a separate room having a computer, a camera and other facilities to the Investigation Officers at all police stations of the state,” he added. Gill said he had convened a meeting of the top brass of the police, in which the main issue of discussion was to further improve the functioning of the Police Department. TNS adds from Fatehgarh Sahib: DGP PS Gill on Tuesday declared the local police station as ISO certified. He gave the certificate to SSP Ranbir Khattra. The local police station has now become the second police station of the state to get the ISO certification. A fresh incident related to illegal activities of gangsters surfaced in this town today when two shopkeepers, who had taken shops on rent about two decades ago, were allegedly threatened by a gangster that they would have to vacate the shops failing which they would face consequences. Irked over this, representatives of various political, social and business associations took out a protest march here today. MLA Sunil Jakhar, senior BJP leader and chairperson of the Punjab Social Welfare Board Vijay Laxmi Bhadu, former MLA Ram Kumar Goyal and president of the Municipal Council participated in it. It is learnt that earlier, a family of this town was allegedly forced to shift to Chandigarh after gangsters allegedly started harassing them and the police “failed” to protect them. Jakhar said leaders and representatives of various associations today urged the SHO concerned to take strong action against those gangsters, who had been named in an application moved by Rajinder Kumar and Dev Raj, both shopkeepers, who had been threatened to vacate their shops located in Bazar number 12. Harjit Singh, the SHO of the city police station, said action would be taken against those who had been named in an application moved by the shopkeepers. Masih, who was in the city recently, said talks in this regard were on with Punjab Chief Minister Parkash Singh Badal. “The Chief Minister has assured that notification in this regard would be issued soon,” he added. On the issue pertaining to the unavailability of land for the graveyards for Muslims, he said wherever Waqf Board land would be available, the same would be provided for graveyard and community centres. “Even Badal has assured that places where the government land is not available for graveyard for minorities, the government will purchase land to end the problem,” he said. Masih said representatives of the Muslim community in Patiala had brought to his light that some unscrupulous elements were encroaching upon some land that is of religious significance to the community. He also took note of non-disbursal of scholarships to some Muslim students studying in government schools here. He has directed the District Education Department that such laxity would not be tolerated, while directing the authorities to ensure that the scholarship money be released to the students without any delay. Rajbir, too, is a shooter and has represented Punjab in National Championships many a times. Heena, a III-year BDS student at Gian Sagar Dental College, inherited the talent from her father. Her younger brother, who is a Class XI non-medical student, has also taken to shooting after watching her success. 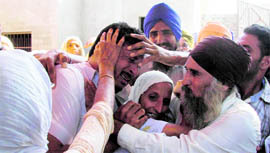 Her mother, Rominder Kaur, said earlier her son used to play cricket, but he gave it up for shooting. In spite of very less training, she has established herself as a world-class shooter within a short span of time, which is quite enigmatic. This year, on her debut in the series of ISSF World Cups, the Punjab-based shooter hit the headlines by winning a silver medal in women’s air pistol event in the Beijing edition. With Heena’s win, the shooting fraternity is now pinning up hopes on her for the upcoming Asian Games.